Bill's Bayou: That's Not Cheese! 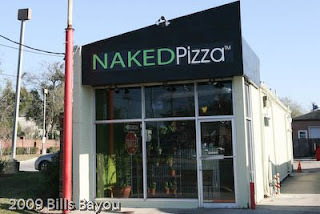 In the former building of "World's Healthiest Pizza", we now have NAKED Pizza. The word is in green and there's a great deal of basil growing in the front window. I'm dubious. The former occupant of this building, "World's Healthiest Pizza" was my candidate for "World's Nastiest Crust." I signed up on WHP's web site for a discount coupon. After eating that pizza, I sent them a message begging them to take me off of their mailing list. The message was simple: "I would no longer like to receive mailings from your store." What I meant to say was "Your pizza is inedible. The dough tastes like someone pulverized cereal boxes and baked it into a tough nasty disc and covered it up to hide that fact." I'll have to try this place to see if they're running a new recipe. I hope to God they are. A co-worker says it's good pizza. But then, he said the same thing about the last occupants of this building. Hint: Either serve good food, or file for bankruptcy. Actually, what happened is you created this problem yourself by being a good cook. My husband did the same thing to us. We used to go out for sushi all the time and out of self-defense because of the prices he decided to start trying to make it at home. Several months later we went back to eat at our favorite restaurant and paid $50 for $7 sushi we could make at home and it was only half as good. Same thing with our brewed iced tea. I can't drink restaurant or store bought any more. FREE DIRT! FREE DIRT! FREE DIRT!